Do you ever wish to go back in time and tell your younger self about self and body image? I feel that for me to wish that means I already know the answer and have come to terms with my self and body image.. which is not true. I think every single one of us, no matter how we look or how people say we look.. we always find some fault in us. Whether it is our hair is not straight enough, not curly enough, a shade or two away from the perfect hair color, we're too tall, too short, too overweight, too skinny, too pale, too dark, wrong face proportions… we just have to find something to put us down and make us fuss about it for all eternity. I'm like that. I've never and still am not happy with so many things related to my looks.. however over the years I've learnt that we can't all look like the hollywood supermodels.. heck even those supermodels suffer from self image.. with them being scrutinized all the time. I just wish I could tell my teenage self to accept who I am.. especially accept the things I can't change about myself, but the things I can? I should stop obsessing and try to do something. Eat healthier, exercise more, and try to set realistic goals for yourself. Don't listen to others, only you need to be happy about yourself, no one should matter. I think that's what I would tell myself. Stop listening to what everyone thinks the perfect image is and start listening to your inner self and what will make you happy. I feel that the struggle the main character is Laura Langston's book suffered from her sudden obsession with her self image after finding out she's losing all her hair. I was able to relate to her and I wish more people will pick up her book and truly understand and appreciate the message the book, and author, are trying to convey. Sixteen-year-old Sloane is given the biggest opportunity of her life—a chance for a film school scholarship—but she only has less than two weeks to produce a video. She also has to work with Isaac Alexander, an irresponsible charmer with whom she shares an uneasy history. Then comes a horrifying discovery: Sloane finds a bald spot on her head. The pink patch, no bigger than a quarter, shouldn’t be there. Neither should the bald spots that follow. Horror gives way to devastation when Sloane is diagnosed with alopecia areata. The autoimmune disease has no cause, no cure and no definitive outcome. The spots might grow over tomorrow or they might be there for life. She could become completely bald. No one knows. Determined to produce her video and keep her condition secret, Sloane finds herself turning into the kind of person she has always mocked: someone obsessed with their looks. She’s also forced to confront a painful truth: she is as judgmental as anyone else … but she saves the harshest judgments for herself. This is another young adult contemporary that tackles meaningful issues while at the same time keeping the themes that make contemporary YA novels so loved (at least by me). In this novel, Sloane is a junior in high school and loved making films. Her dream is to go to film school. The book opens up with Sloane getting the chance to film another video; the first having gone viral and captured the attention of a sponsor that wanted her to enter a competition for a film school scholarship. Sloane is so excited and takes the offer, the catch though is that she has to work with Isaac, who she’s always thought was cocky and apparently has bad history with. This is when the main complication of the novel is introduced… Sloane finds out bald round patches on her head and starts freaking out. It turns out she has a hair loss disease. Sloane has always taken pride in not caring about her appearance or what people think of her, especially since her stepmother cares too much about it (she’s a makeup artist). So now, it is full on freak out mode about her appearance and what would people think about her. I felt really sympathetic towards Sloane. It’s one thing to wear whatever you want by choice, it is another thing to lose all your hair with no choice. The internal struggle was so heartbreaking. This goes to show that every disease is heartbreaking and no one should undermine anyone’s struggles. I’ve seen many people always going to the “at least you don’t have cancer” statement. I don’t think people diagnosed with any ‘lesser’ disease take comfort in that. Sloane has a great best friend and even Isaac is a much-needed support system. I really enjoyed Sloane’s voice, even though she was stubborn and kept this secret for such a long time. I acknowledged her struggles and I especially loved her dynamic relationship with her stepmother. I assumed she would be the typical evil stepmom but I was completely wrong. This reminded me that the books I read would always be subjective for one person, the main protagonist. It reminded me that I shouldn’t rush and judge people without really knowing them and seeing the story from their eyes. 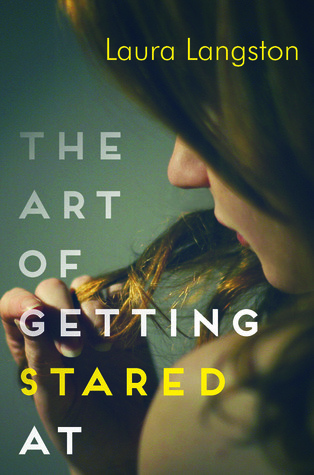 Overall I really enjoyed The Art of Getting Stared At and I hope more books like it will keep on getting written. By the time she hit Grade Four, Laura Langston knew she wanted to be a writer. So did the teachers. It was the persistent daydreaming and invisible friends that tipped them off. Since Laura grew up knowing no writers – and consequently didn’t know how to be one – she became a journalist instead. The trouble is, journalists are expected to tell the truth, the whole truth, and nothing but the truth. But making stuff up is way more fun. So eventually Laura traded one notebook for another and today she writes books for tweens, teens, children and sometimes adults. When she’s not writing, reading or walking her Shetland sheepdogs, Laura can be found spying on people in the grocery store or twisting herself into a pretzel in yoga class. 1. How did you come up with the idea of The Art of Getting Stared At? My ideas generally percolate for a long time before I start to write, and I tend to gather bits and pieces from all over the place, kind of like a bird slowly building a nest. The Art of Getting Stared At was no different. My daughter had a friend who didn’t spend a lot of time on makeup or clothes. That’s not to say she didn’t care what she looked like – she did – but she wasn’t overly concerned with her appearance. For instance, our house was the place to gather before a school dance. We’d provide the pizza and my daughter and her friends would gather and spend hours doing their hair and makeup, as well as ironing clothes, and figuring out what to wear. This particular girl would come and spend maybe twenty minutes putting on a little makeup, doing her hair, changing into something more ‘dance worthy.’ She’d spend the rest of the time either surfing the net or talking to us. She was much more concerned with what was going on in the world than making sure her lipstick was the right color. I was intrigued by that, and by some of the social dynamics I witnessed between her and the other girls. While they were good friends, they thought she was a little bit weird and she thought they were a little bit shallow. Around the same time, I met someone who had lost her hair because of illness. She commented that she’d never truly appreciated her hair until it was gone. I began to wonder how it would be for my daughter’s friend if her appearance was significantly altered. What if she began to obsess about her appearance? How would she feel if she’d always prided herself on being ‘just a little bit better than that?’ From there, the story began to take shape. 2. Why do you write YA? 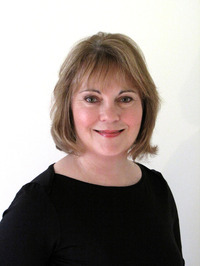 I write for a variety of age groups – everything from picture books for really young children all the way to books for adults under my pseudonym Laura Tobias. But most of my books to date are for teens. I didn’t have the easiest time as a teen – I was on my own from the age of about fourteen. I remember it as being a time of great change, great confusion, and lots of lows as well as highs (not those kinds of highs; I was the classic good girl; I was in charge of driving everybody!) But as well as being a difficult stretch, there were bright spots. I loved school; it gave me a place to belong. I made friends I’ve kept to this day, I fell in love with the guy I eventually married, and I got to know myself and understand my place in the world. So I guess it’s only natural that I’d find myself gravitating to and using that same age and time frame for my characters. 3. I know many girls, and guys, out there suffer from self-image, i won't lie and say I don't either, what is one advice you would give to them? It’s hard to pick one piece of advice to address such a deep subject. If pressed, I’d say tend your inner landscape. By that I mean focus on a core value that’s meaningful and brings you joy. Core values represent our deepest beliefs, our highest priorities and those things that drive us. They’ll be different for everybody. Some might find their joy through nature, spirituality or organized religion. For others, it’s a creative outlet like art, music or sports. Some people find their bliss through giving to others. When we focus on what brings us joy, there’s no time for comparing ourselves to others, which is a total self-esteem killer. It also makes us happier and connects us with a bigger purpose. Ultimately it puts in perspective that externals like our height, weight, the shape of our nose, where we live or the car we drive are pretty insignificant in the greater scheme of things. 4. Who was your favorite character to write about and why? Sloane. I always fall in love with my main characters and Sloane was no different. I wanted to write about a girl who has more important things on her mind than her appearance. That’s not to say she doesn’t care about how she looks – she does – but she doesn’t care to the same extent or even in the same way as most of her peers. That makes her a little out of step with the rest of the crowd. She’s also somewhat judgmental of girls who spend a large percentage of their time on clothes and makeup and appearance too. It was tricky writing about someone like that because judgmental people aren’t necessarily likable, and you need to make your main character likable or readers can’t relate. 5. What's your next book? do you want to stay a little longer in the contemporary world? My next YA is tentatively titled One Good Deed and, yes, it’s another contemporary novel. It’s about a sixteen-year-old girl who prides herself on always doing the right thing. But when one good deed leads to a friend’s death, she’s forced to examine everything she believes about right and wrong. In the process, she faces a betrayal and terrible guilt but in the end grows stronger for it. I also love anything with a paranormal element so I’m working on a series of YA novels about a girl who rescues souls trapped on the cusp – that place that exists between life and death. That’s been fun!